Chic Simplicity – A mix of tees, sweaters, underwear and custom corsettes…multiple. The mix of complex and minimalistic pieces combined so well is what makes this Ace! So I am one of those people who will not publicly appear without a full blowdry. Ok, I exaggerate…it depends where I’ll appear🙄 But my mood literally depends on how my hair looks. I’m not a fan of a flat iron, I don’t even own one, but a blow dryer is a necessity! Since I not too long ago decided to go blonde and intend to go a bit lighter pretty soon, I’m very careful with applying heat. I saw these straightening brushes and was skeptical. I decided to try Luma Brush because it was recommended by a friend I could trust. Now I can tell you but I obviously preferred to show you (in my amateur video above). And you can see how easy it is by my use of only one hand! Zara’s new Spring / Summer Women’s Campaign got me like…with my card information on hold. Everything! From the colors, patterns, fabrics, to the silhouettes; I CANNOT wait for them to addd these pieces to the ‘New Arrivals’ that I can say, without shame, I will be stalking every Tuesday and Thursday from now on. Wanna immerse yourself a little more? Click here and watch the video! Hasn’t been my go to color for some time yet it has been for quite some time, more than two decades to be precise. It started when I was about 5 and obsessed with The Wizard of Oz and refused to take my red shoes off. Oh! and then a few years back there was an obsession with my red blazer thanks to Mischa Barton, when she was reigning in the streetstyle dept. 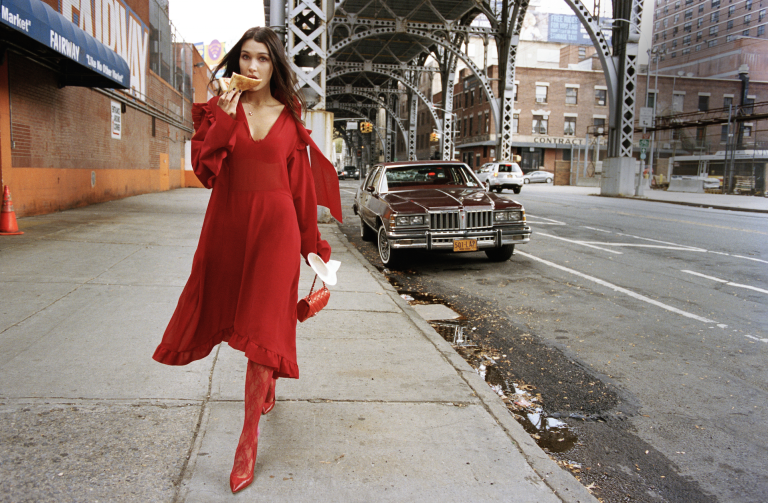 Then there was the red faux leather quilted trousers and Givenchy-esque red suede sandals both c/o of Zara…Now lately no color seems to be my go to color but this Elle spread of Bella in all things red may just inspire me otherwise. From the ballerina shoes to the lace tights, chanel bag, leather jacket, and I can go on, but I’ll let the pictures speak for themselves. I’m feeling another red obsession coming on….